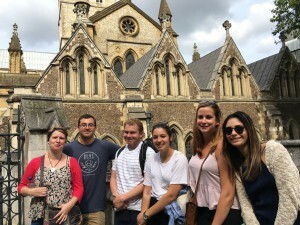 The gang goes on a walking tour and visits Southwark Cathedral where Shakespeare’s brother Edmund is buried. So is medieval poet John Gower! 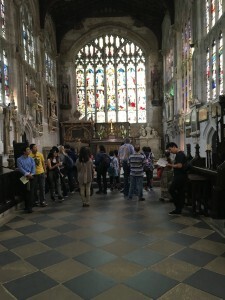 On our last day in Stratford we made the pilgrimage to visit Shakespeare’s final resting place in Holy Trinity Church. The bust was made shortly after his death, and we were told Anne his widow approved of its likeness. For such a world figure now, the church was humble, serene, and comforting. It was a nice contrast to the commercial feel outside in the streets of Stratford. 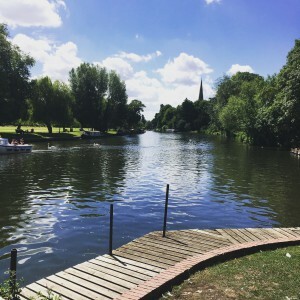 We filled our bellies with Shakespeare and all things touristy for our three days in the town of Shakespeare’s birth and final resting place. 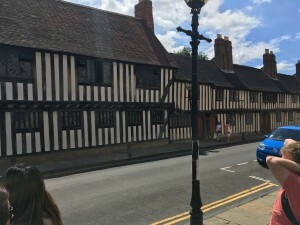 We managed to see two productions at the Royal Shakespeare Company, visit Shakespeare’s home where his father made gloves, see his grammar school where he learned “small Latin and less Greek” (though by our standards, there was nothing small about it), and enjoy the many, many gift shops. 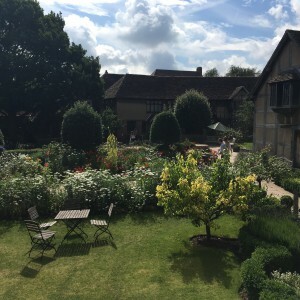 A visit inside the Shakespeare house. Sean and Taylor admire the furniture. Gloves! High fashion back in the day. After tight quarters with low ceilings and tons of visitors, the gardens were a beautiful spot to relax and breathe. William Shakespeare has no doubt enveloped this entire trip, and rightfully so because it is a Shakespeare class. 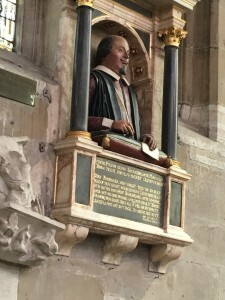 The trip to Stratford-Upon-Avon did not fall short in terms of history and appreciation of the brilliant playwright, but certain interpretations of his plays did. After seeing a fabulous adaptation of Macbeth at Shakespeare’s Globe, my expectations were perhaps a little high. That play did a fantastic job in terms of fitting modernity into a medieval setting. 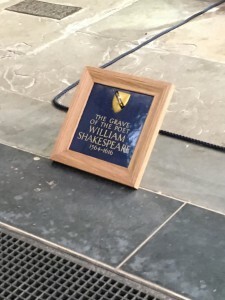 The Royal Shakespeare Company’s performance of Hamlet, however, tried to fit the play into modern times, and, to me, the results were quite unfavorable. Having consistent motifs is an important quality to have in any kind of writing, whether it be a play, a poem, a novel, or any other form of writing. Motifs allow for a level of creativity and imagination to occur from the reader/audience member. For example, the child in Macbeth served as this recurring motif that could be interpreted in an infinite amount of ways. The director of Hamlet, in my opinion, lacked this consistency with his motifs such as the African tribal theme. As my classmates have heard over and over again from me, I was very discontent with Hamlet. There was no commitment to their motifs, the acting was subpar, and the overall feelings I had by the end was anger and disappointment. Anger because of how the director combined several different themes without any transitions as though he didn’t know what he was doing, and disappointment because most of the actors had no idea what they were saying. Elizabethan English is certainly not easy to master and actually know what you’re talking about, but if you’re in an actual production you should probably have some idea. Although quite reluctant, I went in with an open mind for Cymbeline and it was such an improvement. The acting was amazing and there was so much commitment to the characters. This play had a modern theme as well, however it was slightly dystopian with a hint of steampunk in terms of costume choices. 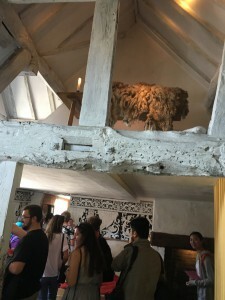 Even the set and props were consistent with the motifs. I also appreciated the different dynamics between the characters, and the swapped genders of some characters because they were seamless and had a very overwhelming effect. Outside of the theatre aspects of the trip, Stratford-Upon-Avon is rather cute. It’s a huge difference from London, although there’s still no shortage of tourists. There’s not a whole lot to do besides shop and praise William Shakespeare, but you can still have fun. If you ever get bored, the Royal Shakespeare Company has a lovely selection of things to color (apparently it’s for the children, but we’re all children at heart). One thing I will critique about Stratford-Upon-Avon is that their mac and cheese is quite subpar, other than that it’s a very cute town. Last Thursday, my class and I went to see a production of Hamlet at the Royal Shakespeare Company Theatre in Stratford-upon-Avon. It was a very interesting performance and I really enjoyed watching it. The production company decided to interpret the story in a very unique way. Instead of having the play take place in medieval Denmark, it took place during modern times in an African culture. Although different from the standard interpretation of Hamlet, I thought that this decision was a very intriguing one to take, as it allowed the audience to see the characters and society of Hamlet in a brand new light. However, the play was not without its flaws, and the most striking of those flaws was the RSC’s inability to fully commit to its African vision of the play. The production company was clearly trying have the play take place in an African setting. This was evident because of their casting, music, and set decisions that they made in regards to the play. However, the lines that the actors used still indicated that the story takes place in Europe; Denmark specifically. In order to do justice to the vision that the RSC had created for Hamlet, they should have made the play take place in an African country. 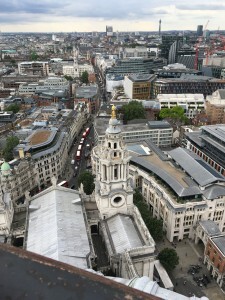 One could argue that it is essential to remain faithful to the text when producing a play, but when the director of Hamlet decided to set the play in what is obviously an African country, the intent of the text was altered anyway. The characters dressed in African clothing, the music used in the play was African, and the design of the set was African. To present this African imagery to the audience and yet insist that the play still takes place in Denmark is asking me to suspend my disbelief too far. 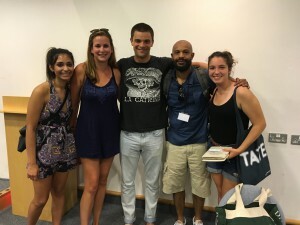 The RSC’s production of Hamlet was fun to watch, but in order to become a stronger performance, the RSC needed to fully commit to their vision of Hamlet in Africa. Such a decision would have strayed from the text, but it would have given the production a stronger continuity and the performance would have been more polished as a whole. 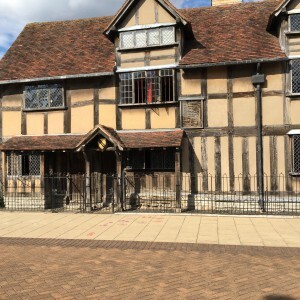 Visiting the Shakespeare Capital, Stratford Upon Avon, I enjoyed watching Hamlet and Cymbeline. Hamlet however, did have many inconsistencies that I did not appreciate as much. 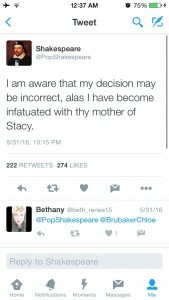 The director of Hamlet really tired to put a modern spin the show by modernizing it. 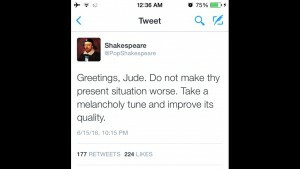 This is evident with Hamlet’s graduation where there are prospect college sweaters, a podium with a microphone and graduation caps; all which were not around in the 1600’s. While modernizing the play the director also used a Black cast for the production. The inconsistency were with the elements used from different Black cultures, Jamaican (dancing/music) and Kenyan (clothing). I am not sure what the director was aiming to do with blending the cultures but personally it also confused me because the play was set in Denmark. Despite the cultural inconsistencies, I was able to find some appreciation in how the director used colors to symbolize death. Through out the play we see Gertrude and Claudius wearing a red-wined color garments. I believe this wine color was supposed to represent the forecasted blood shed caused by Claudius’ and Gertude’s throne desire. At the end we see this red wine color on Laertes, Claudius, Gertrude and Hamlet when they die.